When talking to clients about link building, one of the first things I bring up is why Yahoo Site Explorer and Google Webmaster Tools are the best sources for comprehensive backlink data. I go on to explain how Google purposely offers random and incomplete data when you run a link: command on their search engine. I also explain how MSN's link: command turns on and off as if it where controlled by The Clapper (dating myself a bit with that reference, I know). I then go on to explain that the link: command in Yahoo, which automatically sends you into their Yahoo Site Explorer section, delivers a very comprehensive set of backlink data that can be sorted and filtered in a variety of ways. Google Webmaster Tools offers a similar level of detail, but the data is organized in a slightly different manner; it actually lists every URL that has inbound links pointing to it, and includes the actual number per URL. Note: Just in case you didn't know, in order to access this backlink data, you must first register your site with Google Webmaster Tools and then submit and verify an XML sitemap. Once you've completed that process, Google delivers a wide array of information including this detailed backlink data I'm referring to. So client education aside, what's the absolute best tool for conducting research into the backlink portfolio of your site? Should you go with Google Webmaster Tools or Yahoo Site Explorer? Let's start by comparing the numbers. I checked a number of sites that I have access to via Google Webmaster Tools, and compared the backlink data. Interestingly enough, Yahoo Site Explorer reported more backlinks than Google Webmaster Tools for every domain I checked. Incidentally, in order to compare these numbers, I filtered the Yahoo data by choosing to view "inlinks" (that's Yahoo's term for inbound links/backlinks) and choosing the "Except from this domain" drop-down option as well as the "Entire Site" drop-down option. So it would appear that at Yahoo Site Explorer has the upper hand, but as with most things in life, quantity does not necessarily equal quality. The next thing I chose to analyze was the usefulness of the data being presented, or better yet, the usefulness of how the data is presented. On the surface, it would appear that Google Webmaster Tools has the upper hand in that they deliver detailed backlink data organized by URL, allowing you to easily identify what pages of your site possess the most backlinks as well as exactly where those links are coming from. Yahoo's data is delivered in the form of a search result, simply listing the actual backlinks pointing to either the homepage or the entire site. But as my favorite college football pundit, Lee Corso, likes to say, "not so fast my friend." Thought it is difficult to prove this empirically, it appears as if Yahoo Site Explorer lists the backlinks in order of their potency. In other words, the most powerful links are listed first. If you don't believe me, check it out on your own sites (and don't just base it on the PageRank assigned). Anyhow, back to the task at hand. Admittedly, there are various other factors to consider when evaluating these two backlink analysis tools, but I'm writing a blog post, not a thesis. I'll definitely follow up on this topic, but for the time being, I think I've come to a conclusion. If you're analyzing the backlink portfolio of your own site(s) both Google Webmaster Tools and Yahoo Site Explorer offer uniquely valuable insights. So in this respect, it's a tie. However, if you're looking for competitive insight, it's a no-brainer. Google Webmaster Tools limits you to just your own site, but you can analyze any site under sun in Yahoo Site Explorer. So if you're looking to see what you're competitors are doing (and you definitely should be doing that) it's all about the big Y! Bonus Fun: In Yahoo Site Explorer, you can actually run a backlink query for both www.yahoo.com and www.google.com. Let's just say that their backlink portfolio is a bit humbling. It seems Google is feeling particularly festive this year... 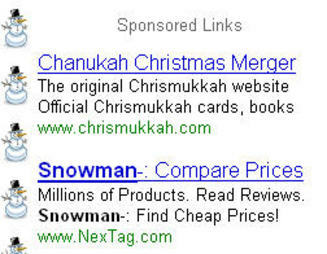 When you do a search for holiday related keywords like "snowman", "Christmas Tree", "Kwanzaa" or "Hanukkah" they are displaying little images like this. What other words can you find that produce a similar result? Muhammad Saleem is a regular guy. He recently graduated from college. He works in the online space. He enjoys offbeat news items. He blogs. So what makes him worthy of mention? Saleem, or rather “msaleem,” is considered to be the one of the most influential users on Digg.com, with over 1,000 popular Diggs to his credit. And that makes the 22-year old a virtual god in the social media space. One of the fundamental reasons for his rise to prominence is the fact that he was an early adopter, joining Digg.com back in September of 2005. But there’s more to it than that. The Chicago native embodies what social networking is supposed to be all about; meeting people and making friends. And how do I know this? Because he told me. Now I’m most definitely not would you would call an early adopter over at Digg, having finally registered back in February of this year. So how did I manage to land an audience with Muhammad? No, it’s not because of my marketing and/or networking prowess. It’s because I recently Dugg one of his submissions and took a second to review his profile. I noticed that he encourages folks to reach out to him via IM, so I decided to give it a shot. I asked him some questions about his professional and personal life. He added me to his IM. I tried to impress him with my SEO resume (don’t think it worked) and we talked a little bit about how difficult it is to convince corporate clients about the virtues of both social media and original content. After a period of inactivity, I told him that it was time for Monday Night Football and he told me it was time for dinner, and that was it. Now at this point, some of you might have your cynicism censors firing off at full tilt. You might think that that Mr. Saleem’s approach is a thinly veiled attempt to further expand his virtual social empire, and that his motivations have little to do with actual human interaction. I gotta tell you. I got the opposite vibe. If anything, it seemed as if Muhammad was turned off by my attempts to turn the conversation into a networking event. It was refreshing, and it has inspired me to evaluate how I go about interacting with virtual friends and acquaintances. Oh, and I also added my IM info to my Digg profile! There were a lot of memorable moments in the 1939 classic, "The Wizard of Oz". My favorite is when Dorothy first lands in Oz and the movie suddenly shifts from black and white to color. However, there was another moment that has proven to be more significant on many levels; when we find out the wizard is really just an old fragile man hiding behind a grand facade. Recently, I've begun to wonder if much like that famed wizard, Google's algorithm is more smoke and mirrors than hard substance. While tinkering around with Google's various search commands during the Thanksgiving "break" (no such thing for SEO) I came across a startling pattern. It seemed as if every natural search engine result I pulled up was a mirror image of its corresponding allinanchor result. The allinanchor command essentially shows what urls have the most inbound links containing anchor text for a specific search term. To test it out, simply visit Google and type in "allinanchor:" followed by your chosen search term. Allinanchor tutorials aside, the strikingly identical result sets stopped me in my tracks. Why were the allinanchor results virtually identical to natural search queries for the exact same search terms? At first, I figured that allinanchor was simply broken. After all, notable SEO voices like randfish have noticed issues with the command over the years. It's also not a good sign when Google's own help page on advanced search operators does not list either inanchor or allinanchor. However, a closer look at the command revealed that some of the telltale signs of malfunction where missing. First and foremost, the result sets for regular search and allinanchor are not completely identical. Secondly, the amount of results for each is not identical. Lastly, there seem to be plenty of well-respected SEO folks that still refer to allinanchor and believe that it is still a valid command within Google. And if it is, then Google's algorithm is much simpler than I previously believed. I tested a variety of search terms, ranging from single words to three-word phrases and across various genres including news, products, celebrities, and SEO related topics. *allinanchor trumped factors such as indexed pages, page backlink totals, domain backlink totals, keyword density (no surprise) and domain age, which are considered to be fundamental ranking indicators. Note: I want to take a moment to mention the folks over at webuildpages.com for providing a tremendously useful tool that allowed me to search for all of the aforementioned factors all at once. They've got other great tools over there as well. So what did I take away from this little exercise in data mining? It's simple. If Google's allinanchor command still works, then it means that the amount of anchor text containing a specific search term is by far the most influential factor in determining Google search engine results, trumping virtually all other SEO factors. In layman's terms, anchor text is king. Scary, huh? Although, to be fair, even if Google's algo is this simplistic, it still somehow provides what I believe to be by far the most relevant and useful results of any engine. Sadly, I'm not totally convinced that the allinanchor command is working, so I encourage all who read this to chime in with anecdotes and evidence that either refutes or confirms its validity. I also encourage you to find examples of search engine results where allinanchor does not necessarily predict ranking order. After all, the power and insight of the community almost always trumps that of the individual, and I would really like to get to the bottom of this potential epiphany.